vPairTM antibodies represent a pair of fully characterized antibodies that recognize two different regions of a target protein. The product is developed by Abiocode to address whether the signal observed truly represents the protein of interest, an often encountered issue in antibody-based assays. The use of a pair of fully characterized vPairTM antibodies in the same assay can validate signal specificity since vPairTM antibodies recognize two independent epitopes of the same protein. Different sets of vPairTM antibodies are developed at Abiocode to work with specific applications, including antibody arrays, Western blot, IP-Western, ChIP, IHC, and FACS. The bromodomain is a structural motif characteristic of proteins involved in chromatin-dependent regulation of transcription. Bromodomain proteins have been identified as integral components of chromatin remodeling complexes and frequently possess histone acetyltransferase activity. Bromodomain adjacent to zinc finger domain protein 2B (BAZ2B) is one of the recently identified bromodomain proteins, which may play a role in transcriptional regulation by interacting with ISWI. Rabbit polyclonal antibodies were produced by immunizing animals with GST-fusion proteins containing 2 distinct N-terminal regions of human BAZ2B. 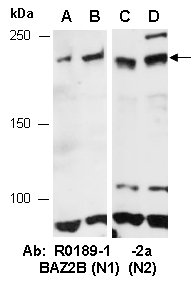 Antibodies were purified by affinity purification using immunogen. regions of human BAZ2B at RT for 2 h.